Bar Crusher boat show discount! 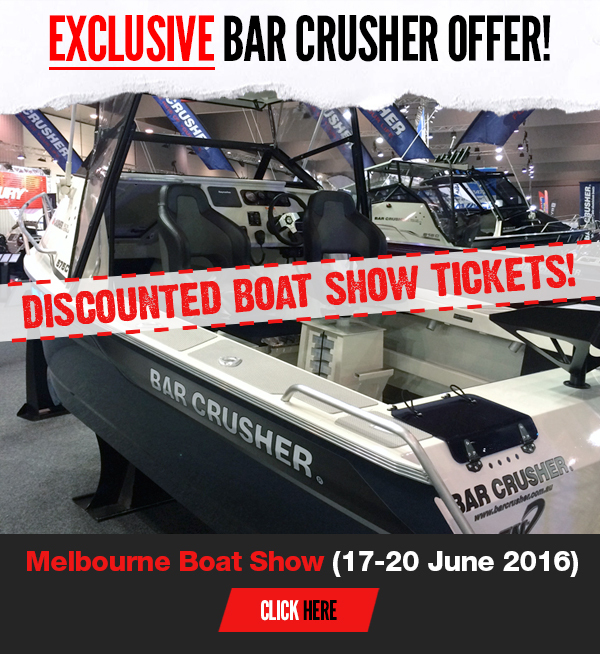 If you’ve been thinking about buying a boat, the 2016 Melbourne Boat Show (17-20 June) is the place to check out a large range of new Bar Crusher boats in one central location. We’re pretty excited to release our 2016 model range at the show – and we’d like you to be among the first to see it – so we’re offering you a 25% discount on the price of boat show tickets! Simply visit www.melbourneboatshow.com.au, enter the promo code BARCRUSHER and select the tickets you want to buy. Some of the new features to be found on various models across the 2016 Bar Crusher range include new hard top designs and dash layouts, re-designed rocket launchers, extra heavy-duty bowsprits and bow/grab rails, fresh paint schemes, Bar Crusher’s exclusive Game Lock™ coaming, and more – all of which have been carefully-considered to further improve your boating and fishing experience. CLICK HERE to see the full range of Bar Crusher boats on display at the 2016 Melbourne Boat Show. Come and check out our boats (located on stand C4), pick-up a free copy of our boat buyer’s guide, and have a chat with us about the best boat for your needs.